On 16. December 1942, commander of SS and Gestapo troops Heinrich Himmler issued the order to deport the Roma from the European countries under Nazi occupation into the “family camp” Auschwitz – Birkenau. According to the available information, upon Himmler’s order some 25 thousand Roma were deported to Auschwitz, while just in the night of August 2 and 3 in 1944, 2,897 persons, including the children and the elderly, were sent to crematory. The genocide of the Roma in the Second World War stands as one of the most tragic episodes of that armed conflict, which has been almost forgotten among the modern generations. The systematic extinction of the Roma people, started on 16 December 1942 on the principles and with methods used for the organized liquidation of the Jews, is the genocide that resulted in the suffering and demise of between a half and two million European Roma. The exact number has never been established, one of the reasons being that nobody has dealt seriously with this subject. Roma have been discovered, since only then several countries published their archives about the issue. Once when German Army entered in Serbia on mid-April 1941, the Germans have, naturally, organized their occupation system, and the local authorities have adapted immediately. And by the end of May the whole system of regulations, i.e. orders and decrees against the Jews and Roma was in place. The most important of those was the decree of 30 May 1941, which effectively put the Jews and Roma, as we call them today, but back than and unfortunately to this day the word Gypsy is used, out of the law. They were banned from visiting public places, forced to wear yellow strips – Jews with the “Juden” written on it, and the Roma with “Gypsy”. They were thus unable to use the public transport etc. It represented the beginning of the genocide, which was to take larger scale in the following months, escalating in 1942. And various types of camps were set up, where the prisoners were put, primarily those of Jewish and Roma nationalities. The system of camps that existed in Serbia was different. There were various camps. 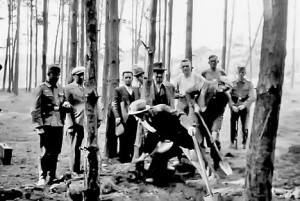 First camp was set for the communists and anti-Fascist fighters, which is the camp in Banjica in Belgrade. The camp in Banjica was different because the Jews and Roma passed through it. In September 1941 a group of Roma went through it, previously arrested by the special police, i.e. gendarmes, in Meljak, as well as another group of Roma from Sremcica. Much more important, when the genocide of the Roma is at issue, is actually the establishing of the camp at Topovske Supe (Cannon sheds) in Belgrade. It was set up in mid-August ’41 and was originally intended for Jewish men from Banat and Belgrade. Soon after it became the camp, i.e. reservoir, of hostages, as that is where the Germans would simply take the hostages to be shot in reprimand for the partisan actions of the national liberation fighters. Now, here is what happened – in their organization, in a manner of speaking, their organized work Germans were shooting primarily the Jewish men from Banat, then the Jewish men from Belgrade… at one point they needed more hostages…and…being that the Roma are part of the population that ought to be exterminated, they went after the Roma from Belgrade. In coordination with the special police and gendarmes, they organized big arrests of the Roma men from Belgrade, from the city quarters where the Roma were settled. At the end of October, some 1,500 of them were arrested and taken to the camp at Topovske Supe, where they stayed for three days before being taken to the firing squad, mostly in Jabuka. 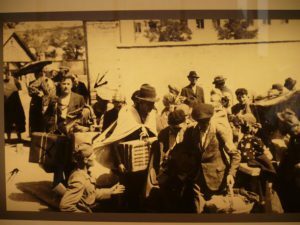 My husband Mika Lekic, a musician, was taken during the mass Gypsy gathering in Marinkova Bara on 28 October 1941, at 3.30 in the morning, from the house in the Peke Pavlovica street 32. 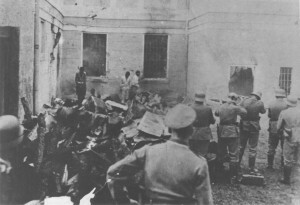 Two local policemen came, with two agents and two German soldiers. One of the agents was named Dulic, I have no other information, while the other was called Selja, I believe, but again I have no further information. I did not know the two sentries, but I do remember that one was very tall, with a mole above the right lip. They ordered my husband to get dressed and go with them. My husband put on the new black suit, new shoes, new coat, and also took two sets of underwear and a rug to cover himself, all of which were prepared in advanced, since we knew the police were picking the Gypsies. My husband, 40 years old, was born in Ub, of the Orthodox faith, and he lived in Belgrade for more than 20 years. Besides Banjica, the Sajmiste (Fair) camp was the biggest one in the territory of Belgrade during WWII. In less than three years almost 40 thousand, men, women and children were closed in this camp. A few days after the first raid, the gendarmes came again to the Roma houses in the Yatagan quarters. Some by force, some by promises that they will take us to our bothers and husbands that had been taken by force to Ada Ciganlija to cut wood, they herded the rest of us and brought us to the Sajmiste camp, which earlier was only for the Jews. There, we – the women, children and men who had avoided the first raid – were put in the 5th pavilion. The Jews who had been there previously were transferred to the 6th. The life was terrible, we only got food once in four days. We were given the scraps from what German soldiers had eaten. I noticed because in the mesh we were served it was possible to discern few dishes. Since we had not brought any dishes with us, they would simply pour it in our hands. Those who got that watery substance, sometimes very hot, had to drink it all at once, or else it would leak away. We only got a little piece of bread or corn bread once in four days. We would be foraging for all kinds of food scraps that were edible. Once, I saw a piece of stale bread right next to the wire fence, and without thinking of the threatened consequences, being very hungry, I came closer to the fence and was just to pick it up when a bullet whistled. At first, I did not even realize they were shooting at me, that is how scared I was. Only later I felt something warm and sticky in the shoe and realized I was wounded. Probably due to ear, I felt no pain at all, but my shoe was still filling with blood. That piece of stale bread stayed there untouched. I have the scar from that fascist bullet even today. It does not hurt, but when I walk long or with weather changes I feel a dull pain that reminds me how it was possible to lose one’s live over the mould-covered bite of bread. Suicides were common in the camp. Hungry, scarcely clothed in harsh winter, the Romani were being forced to carry the wood for the German kitchen over the iced Sava river. 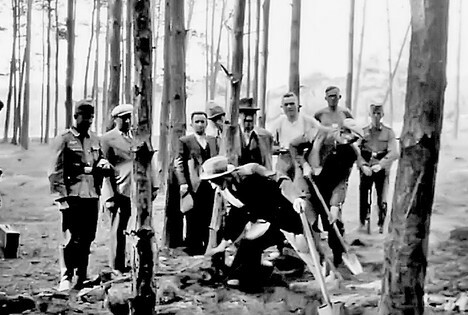 I remember there were several attempts to escape the camp, but the Germans stopped them with rifle shots. Some 600 Roma women and children in camp Sajmište (Fair) were living in horrible conditions, so many of them just died of starvation and illness. They say even worse than the Jews. Much worse. We know it from the testimonies of the surviving Jewish women themselves. All Belgrade Jewish women with children, as well as those from Banat, were in the 3rd pavilion – probably some 5,000 people. The 5th pavilion was accommodating the Jewish women brought from the inner regions, there were particularly many of them from Sabac. There was probably 2,000 souls in that pavilion. Besides that, there was a pavilion whose number I don’t remember, where Gypsies were put, and they lived in even worse conditions than we did. The nights were most terrible, when little children, tortured by hunger and cold, were crying and begging for food or better cover. There is not much documentation about what happened to the Roma in the camps, especially in Belgrade, but there is precious material gathered by the Yugoslav authorities immediately after the war. A segment of that material consists of the testimonies of the survivors that you have read, which were handed over to the State Commission for the crimes committed by the occupiers and their collaborators, and which ran a detailed investigation into the crimes over the entire former Yugoslavia. The almost forgotten holocaust of the Roma has consequences on the present… Regardless of the fact that the Roma make the largest ethnic minority in Europe with at least 12 million members, the hatred, racism and discrimination follow them everywhere. The policy of memories is a very controversial and devastating battleground, both politically and ethically. Remembrance and commemoration must not be limited to cultural and symbolic sphere of monuments and ceremonies, not can they be boiled down to a subject of scientific analysis. The memory of genocide and commemoration of the victims are especially tightly connected with the current politics and dominant moral and ethical values. From what we have seen so far, the attitude toward the Roma in the 21st century Europe did not change drastically comparing to earlier centuries. The Roma are still on the margins of the society, and contemporary forms of antagonism are still surviving, even after Auschwitz.